Hard to find hardware from window transoms to plumbing fixtures. Selling brass door knobs, knockers, mailboxes, fireplace accessories, cabinet knobs and pulls, hooks, wrought iron hardware, and bathroom accessories. An extensive line of wood knobs and wood pulls, for cabinet and furniture doors and drawers, in cherry, maple, walnut, oak, mahogany, ash, and pine. Handcrafted art, including colorfully painted ceramic drawer pulls, knobs, and other decorative pieces. Offers knob pulls for cabinets, drawers, kitchen and bathroom hardware. Decorative hardware collection consisting of unique knobs, pulls, and hooks. Wholesale kitchen cabinet and furniture hardware. 1000s of knobs, handles and pulls. Secure online ordering. Ceiling fan pulls, lamp finials, vertical blind pulls and decorative plates. Information on handmade collectibles, gift items and store location. Offering hand-painted hardwood knobs and drawer pulls that are custom-designed with choice of colors and patterns. Hand painted cabinet knobs, drawer pulls and handles, housewares, accessories, and decorative bowls. Many designs and colors. Offering kitchen cabinet knobs as well as general cabinet pulls and decorative hardware from Hafele, Amerock and others. Handcrafted pewter decorative cabinet knobs, drawer pulls, door knockers and coat hooks. Large selection of unique decorative handles, knobs, and pulls. Custom built stainless steel handles. Decorative designs for the home with a wide variety of knobs, pulls, handles, towel rings and soap dishes. Specially designed knobs and pulls. Can take your concept from art renderings to stunning, dimensional hardware that youll always treasure. Manufacturer of hardware from 100% lead-free pewter including knobs, drawer pulls, door knockers, and coathooks in a variety of motifs. Custom door hardware including decorative door knobs, door pulls, door handles, and wine cabinet hardware. Great Good Things presents a collection of kids hand painted furniture, cabinet knobs & drawer pulls, furniture & room decor. Site offers wholesale & retail ceiling fan pulls, lamp finials, vertical blind pulls, and decorative plates. Offers new glass and tin door knobs with stain, paint, and decals. Offer hand crafted wooden guitar knobs, pickup rings and toggle caps. Architectural antique reproduction door hardware with skeleton keys. Wrought iron and steel knobs and levers, glass, crystal and porcelain door knobs. If the business hours of Antique Hardware and Home Catalog in may vary on holidays like Valentine’s Day, Washington’s Birthday, St. Patrick’s Day, Easter, Easter eve and Mother’s day. We display standard opening hours and price ranges in our profile site. We recommend to check out antiquehardware.com/ for further information. 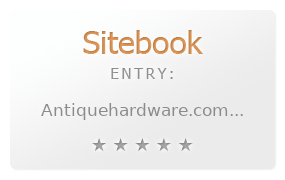 You can also search for Alternatives for antiquehardware.com/ on our Review Site Sitebook.org All trademarks are the property of their respective owners. If we should delete this entry, please send us a short E-Mail.